The 1996 breeding season at Loro Parque was particularly successful, both in the total number of birds reared and in the diversity of taxon which reproduced. While our main objective is to have as many as possible of our breeding birds rear their own chicks, with such a large number of birds being reared each year, it is unavoidable that a proportion of these will require artificial neonatal care, if they are to survive. The most frequently used approach in such cases is to hand-rear the chicks, which we do with great success. An alternative solution often available to us is the fostering of eggs or chicks from unreliable parents, with a different pair of birds which have a proven record as good parents and which, for any one of a number of reasons, are incubating eggs which are infertile or are of far less importance than the eggs which are in need of reliable foster parents. In recent years we have had cause to use foster parents on several occasions and the results have been very good. With some species which are kept communally, or when several pairs are maintained in the collection, it can be a simple solution to foster eggs from an unreliable pair of parrots, to a different pair of the same species. This should be done only when the foster parents have no viable eggs of their own, otherwise if eggs are given to a pair which have fertile eggs of their own, problems can arise later when trying to establish the true parentage of the chicks. The FosteringGreater Vasa Parrot Coracopsis vasa is one species where we have some pairs which either break their eggs or are unreliable in incubating them, by contrast other pairs are excellent parents. We have been fortunate for the past two years in that two spare females (which are housed together) have laid and incubated eggs consistently. In 1995 and in 1996 we gave these two females fertile eggs from other Vasa Parrots which are unreliable parents and so far the two have a perfect record in rearing chicks from eggs that they have fostered. When birds of the same species are not available as foster parents, then fostering with birds of the same genus, or of a very closely related genus, can produce good results. For several years at Loro Parque it has been common practice to foster rare Amazona species with common species of Amazona, which has always been done with a very high level of success. In 1996 13 FosteringRed-browed Amazon Amazona rhodocorytha chicks were reared by foster parents. The chicks were shared between six different sets of foster parents, two pairs of Green-cheeked Amazon Amazona viridigenalisA. viridigenalis, a pair of Blue-fronted Amazon Amazona aestivaA. aestiva, a pair of Yellow-fronted Amazon Amazona ochrocephalaA. ochrocephala, a pair of Blue-headed Pionus Pionus menstruus and a pair of Maximilian's Pionus Pionus maximilianiP. maximiliani. A good example of the fostering of chicks between closely related genera is that of the FosteringHyacinth Macaw Anodorhynchus hyacinthinus which is now being reared with increasing success at Loro Parque. In 1996 nine chicks were reared. One of the reasons why the breeding of this species had not been successful in previous years is that only one of our breeding pairs can be considered to be reliable parents, other pairs frequently demonstrate poor incubation, with eggs being damaged or not incubated. In such cases we continue to look at the husbandry of these pairs to see if we can improve their nest site provision and surroundings and to see if we can increase the chances of them rearing their own chicks. At the same time we looked this year to ensure that an early clutch of eggs from each of these pairs were removed and given to foster parents. Two pairs of Green-winged Macaws Ara chloroptera were chosen as the foster parents and in both eases the eggs hatched and the resulting chicks were cared for perfectly. Hand-rearing of Hyacinth Macaws is still practised at Loro Parque on occasions when we lack other alternatives, but our preference is for parent rearing or foster rearing. Another good example of fostering between different genera was undertaken in 1994, when a FosteringHorned Parrakeet Eunymphicus cornutus was reared by a pair of Golden-mantled Rosellas Platycercus eximius, made necessary because our exhibition pair have consistently lost within the first day of life, the chicks that they have hatched. The chick grew and fledged without problems under the care of the rosellas. This again demonstrates the flexibility of good foster parents if they are well managed and carefully observed. While closely related species are normally the best option when potential foster parents are being sought, some consideration of the comparative physical size, if such a difference exists between the species concerned, is an obvious fact that has to be taken into account. When looking at the possibilities for fostering eggs of the FosteringGolden Conure AratingagauroubaAratinga gauroubaGaurouba gauroubaAratingagauroubaAratinga gaurouba, we considered several different pairs of closely related conures of the genus Aratinga. The decision was finally based on balancing the benefits of choosing the largest species of Aratinga which was breeding at the time, against relying upon the experience of the pair of Aratinga with the best record of proven parenthood. We decided to opt for experience and a pair of Sun Conures Aratinga soistitialis with a prolific breeding record were our choice. 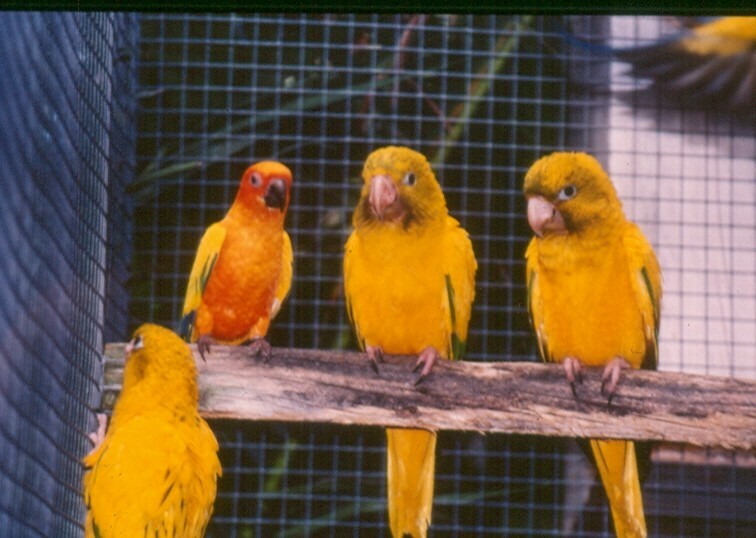 The Sun Conure is closely related to the Golden Conure, having a similar physical appearance, feeding response, incubation time and chick growth rate. Our one concern was that the larger size of the Golden Conure chicks might mean they would prove too large a workload for the foster parents. While Sun Conures can easily rear three or four chicks of their own, three growing Golden Conure chicks might prove too great a burden. On this occasion the foster parents carried out their task very successfully, with our only concern being the weaning period in the first week after the chicks had fledged. This was an exceptional case and normally we would not have left all of the chicks with the foster parents as the chicks increased in body weight. but would have removed either one or two to ease their task. A much more unusual example of the flexibility in the use of foster parents was the use of a pair of Derbyan Parrakeets Psittacula derbiana to successfully incubate FosteringGang-gang Cockatoo Callocephalon fimbriatum eggs, and then rear the resulting two chicks for the first two weeks of their lives, until the chicks were removed to the nursery once they had reached a large size. This was a particularly memorable case of using foster parents, bearing in mind the obvious differences between the genera Psittacula and Callocephalon, but as long as the chicks are removed after the Iirst two weeks, such differences are not an obstacle. Past history of parenthood - Obviously, only birds with a very good record as successful parents should be considered as potential foster parents. Health status - As an extension of considering the past history of parenthood, only a pair of birds which have a clean health history should be considered as foster parents, particularly if a rare or endangered species is involved. The potential foster parents being considered should have no history of bacterial or fungal infections, Chiamydia, protozoa, or intestinal parasitic infestations, and should obviously be free of any virus. Size - As already mentioned when describing the rearing of the three Golden Conure chicks by a pair of Sun Conures, size differences between the parents of chicks being fostered is not necessarily a prohibiting factor. However, careful thought should be given if a significant size difference is involved and careful observation of the chicks' development will be required to make sure that as the chicks grow and increase their body weight and food intake, that this does not become a task with which the foster parents cannot cope. Appearance and behaviour - In my experience, the appearance of the chick is not a critical factor, so long as eggs are transferred beneath the foster parents and not a partially developed chick. I know of several instances in which chicks of a quite different physical appearance have been reared by foster parents. A more significant consideration is the behaviour of the chick and foster parents, particularly in the feeding response. Most psittacines have fairly uniform chick food-solicitation behaviour, but what can vary is the force with which the feeding action is undertaken. Some species (such as Aratinga conures) with a forceful feeding action may injure chicks of a more delicate species which they are trying to rear. If these four main points are taken into account, then foster parenthood is a useful and interesting avicultural husbandry technique which can have a high level of success.